The Eu:CROPIS mission was launched from Vandenberg Air Force Base in California at 19:34 CET on 3 December 2018 on board a Falcon 9 launcher. 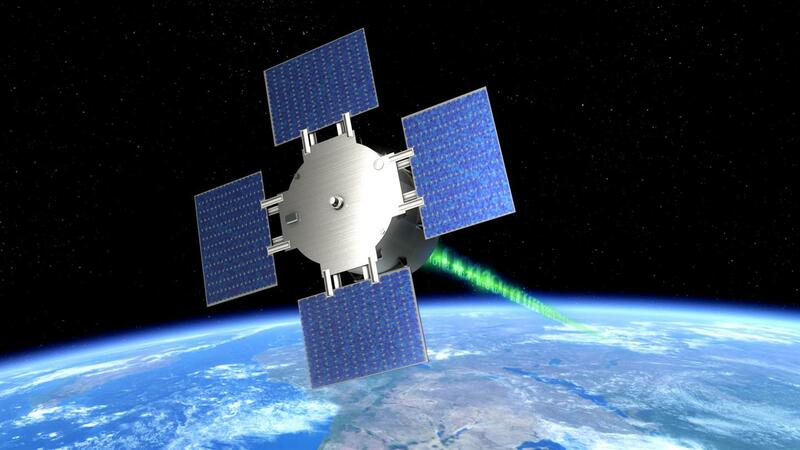 The Eu:CROPIS (Euglena and Combined Regenerative Organic-Food Production in Space) was launched in 2018. The mission is intended to show how biological life support systems can be used to supply food on long-term missions. The satellite integrated at the DLR Institute of Space Systems is specially packed for shipping. Cosmic tomatoes will grow in two greenhouses inside the Eu:CROPIS satellite. On 3 December, the DLR Eu:CROPIS mission was successfully launched from Vandenberg Air Force Base in California. A biofilter will be used to convert urine into fertiliser in a closed life support system. The germination and ripening of the tomatoes in the two greenhouses will indicate that the experiment is going well. By rotating around its own axis, the satellite can simulate gravitational conditions like those on the Moon or Mars. At 19:34 CET on 3 December 2018, the German Aerospace Center (Deutsches Zentrum für Luft- und Raumfahrt; DLR) Eu:CROPIS mission was launched into space from Vandenberg Air Force Base in California. A Falcon 9 from the US aerospace company SpaceX carried two biological life support systems comprising greenhouses, dwarf tomato seeds, single-celled algae and synthetic urine on a satellite up to a near-Earth orbit at an altitude of 600 kilometres. The aim is for the seeds to germinate in space and continue to grow due to the successful conversion of urine into a fertiliser solution. The mission is intended to show how biological life support systems can be used to supply food on long-term missions. 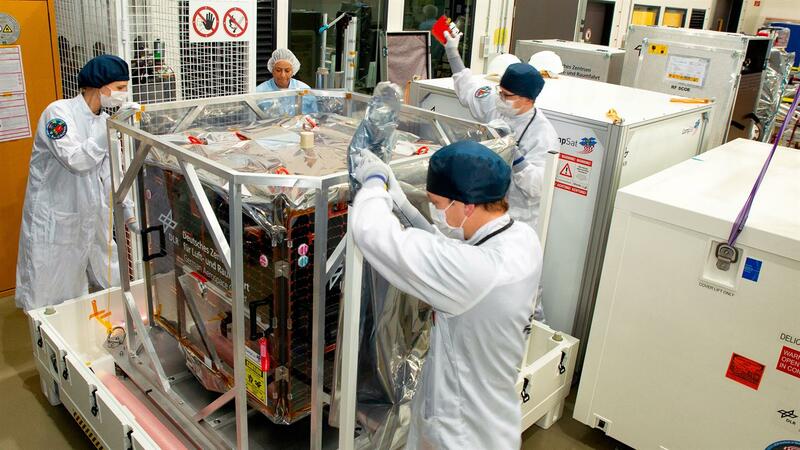 The Eu:CROPIS satellite, which is approximately one cubic metre in size and weighs 230 kilograms with its biological payload, was designed and built by DLR and the Friedrich Alexander University (FAU) in Erlangen–Nuremberg. "With the Eu:CROPIS mission, DLR is making a significant contribution towards future long-term missions, showing whether and how a closed biological life support system can function and produce food far away from Earth. In the process, DLR has once again demonstrated its systems expertise in the design and construction of satellites," says Hansjörg Dittus, DLR Executive Board Member for Space Research and Technology. The satellite will separate from the Falcon 9 carrier rocket 35 minutes after the launch in its orbit. The DLR German Space Operations Center (GSOC) in Oberpfaffenhohen, which will control the satellite, expects first radio contact about one and a half hours after the launch. Eu:CROPIS stands for 'Euglena and Combined Regenerative Organic-food Production in Space'. "This mission seeks to show that urine can be converted into nutrients even under lunar and Martian gravity conditions," says Jens Hauslage of the DLR Institute of Aerospace Medicine in Cologne. Inside the satellite are two greenhouses, each maintained as a pressurised closed loop system. The core elements of these systems are a biofilter and green algae (Euglena gracilis). The biofilter consists of a 400-millilitre chamber filled with lava stones. Bacteria have settled on and within these porous stones, which convert the urine flowing over them into nitrate in a water cycle. "The nutrient solution obtained is used to cultivate the tomatoes. This is, so to speak, an indicator that our experiment is proceeding successfully in space," says Hauslage. The single-celled Euglena gracilis, also known as green algae, which will be carried into space as a 500-millilitre 'green solution', also play a key role in the system. Firstly, they can produce oxygen, which will prove particularly important at the start of the experiment, when the tomatoes are not yet generating oxygen via photosynthesis. Secondly, the Euglena can detoxify the system and protect it against excessive levels of ammonia, which can occur if the biofilter is not functioning properly. "We use the properties of communities of organisms to apply purely organic methods for transforming waste into substances that we need to grow crop plants, in this case tomatoes. As such, we are preparing the vital groundwork for supplying astronauts with food on future long-term missions," explains Hauslage. He and Michael Lebert (FAU in Erlangen) are the scientific instigators behind the project, and are now leading the Eu:CROPIS mission. The processes at play inside the greenhouses are recorded by cameras and transmitted to the GSOC and the Microgravity User Support Center (MUSC). LED light provides a day-and-night rhythm, while a pressure tank ensures atmospheric pressure of one bar, which corresponds with that of Earth's. Also on board the Eu:CROPIS satellite are two RAMIS (Radiation Measurement in Space) devices, developed by the Institute of Aerospace Medicine. These will measure radiation levels both inside and outside the satellite during the mission. DLR is also sending the on-board computer SCORE (SCalable On-BoaRd Computing Experiment), developed by the Institute of Space Systems, to test the principle of a COBC (Compact On-Board Computer) in space for the first time. The computer will process the images taken by the on-board cameras. NASA will also be running a PowerCell experiment relating to the production of useful substances in space using bacteria. During the mission, the satellite will rotate around its longitudinal axis. Depending on the rotation rate, this generates a specific level of altered gravity. During the first part of the experimental phase, gravitational conditions like those on the Moon will be created (0.16 times Earth's gravitational pull), with 20 rotations per minute. This will last for around 23 weeks. The first greenhouse will be put into operation during this phase. In the second research phase, the satellite will simulate gravity on Mars (0.38 times that of Earth) by rotating 32 times per minute. Experiments will now take place in the second life support system. The satellite was built at the DLR Institute of Space Systems in Bremen. The DLR Institute of Composite Structures and Adaptive Systems in Braunschweig developed the frame structure and the pressure tank. Power is supplied via four solar panels, each with a surface area of one square metre. DLR scientists were able to draw on their experience of developing standard components for satellites in the run-up to the mission. Depending on the payload, they are able to design and construct satellites of different sizes quickly and flexibly. "In its efforts towards this mission, DLR has shown that it can develop satellites efficiently and cost-effectively. This component-oriented design is a unique feature of DLR, enabling us to support lots of different research missions," says Hartmut Müller, Project Manager for the satellite’s construction at the DLR Institute of Space Systems. 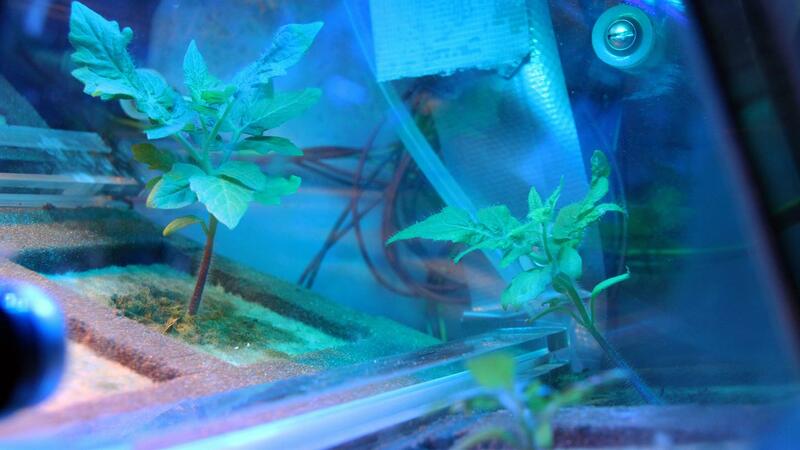 Fresh vegetables that thrive in space thanks to converted organic waste products are not only a prerequisite for long-term space travel, but the research findings from such projects can also be useful on Earth. If urine or manure can be recycled into fresh water and nutrients usable by plants, this could improve living conditions in overcrowded areas or in places that have an extreme shortage of drinking water, while providing relief for soil and groundwater – another of DLR’s areas of research. Mon 03.12 19:34 10:34 Launch from Vandenberg Air Force Base in California. Mon 03.12 20:09 11:09 Separation, 35 minutes after the start. 12:00 GSOC expects first radio contact from the Eu: CROPIS satellite. Euglena are in hibernation in damp cotton wool. 1 and 2 Commissioning phase, the function of the satellite is tested, the satellite is commissioned by GSOC. The Euglena are brought out of hibernation and reproduce. The Euglena continue to multiply and produce oxygen. They protect the system against excessive levels of ammonia, which can occur if the biofilter is not functioning properly. 5 and 6 0.1g gravitation, Euglena is still active. Weeks 7 to 30 Experiment starts in the first greenhouse, rotation creates Lunar gravity conditions (0.16 g). The 'lunar' greenhouse is watered, the biofilter is activated. Euglena in the second greenhouse are activated. Rotation creates Martian gravitational conditions (0.38 g). The 'Mars' greenhouse is irrigated, the biofilter is activated.